The 75th edition of the Golden Globe Awards took place on 7 January in Beverly Hills, California and it was a total blackout. Stars turned up in throngs wearing all black to show unity and solidarity with the Time's Up movement. Firstpost usually does a best and worst dressed list as and when an award show airs, however, this was no ordinary event. The landmark Hollywood event had so much positivity, love and support floating about — that we couldn't find it in our hearts to criticise anyone. So here's our list of best dressed women who absolutely slayed the red carpet at the 75th Golden Globe awards. Disclaimer: There is no pattern for our choices whatsoever; we promise. Not like any of these women are survivors or anything, nope, nothing like that. We're not biased, you're biased. Reese Witherspoon at the 75th Golden Globe Awards. Image from AP. Reese Witherspoon stunned in a black off-shoulder gown at this year's Globes, but more than it was her glowing skin and ever smiling face that won our hearts. Not only did she she nail her red carpet appearance, but she was also one of the spearheaders of the Time's Up movement — an empowering fact which only added to her shine. Witherspoon has previously alleged that she was sexually assaulted by a director (who she chose not to name) when she was only 16-years-old, but the actor says she was advised (read:told) to remain silent by agents and producers. The first incident was just one of the many experiences of harassment and sexual assault that Witherspoon faced throughout her career. “I have my own experiences that have come back to me very vividly and I find it really hard to sleep, hard to think, hard to communicate a lot of the feelings that I’ve been having about anxiety, the guilt for not speaking up earlier. I’ve had multiple experiences of harassment and sexual assault and I don’t speak about them very often. After hearing all the stories these past few days and hearing these brave women speak up tonight about things that we’re kind of told to sweep under the rug and not to talk about, it’s made me want to speak up and speak up loudly because I actually felt less alone this week than I have ever felt in my entire career,” she said, according to a report in The Guardian. Angelina Jolie at the 75th Golden Globe Awards. Image from AP. She isn't considered one of the most beautiful women in the world for nothing. Angelina Jolie not only rocked the red carpet (on which she made an appearance with her son Pax), but she also added the oh-so-chic hint of subtle feathers to her outfit which very few celebrities can carry out with aplomb and panache (in our extremely humble opinion). Jolie was one of the several women who came forward and accused disgraced movie mogul Harvey Weinstein of sexual misconduct, alleging that she had a bad experience with Weinstein in her youth (at the time when her 1990s film Playing by Heart was due to release). Weinstein reportedly made unwanted advances towards Jolie in a hotel room. The actor said she "chose never to work with him again and warn others when they did." 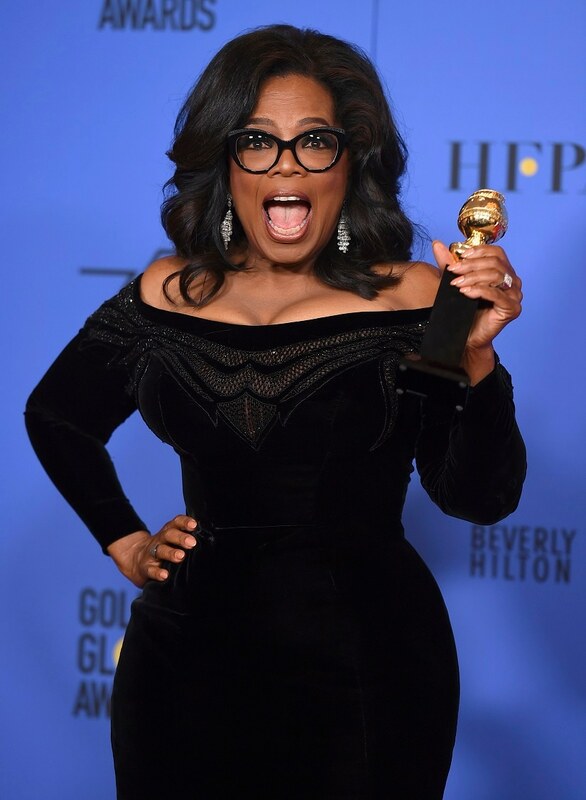 Oprah Winfrey at the 75th Golden Globe Awards. Image from AP. Donning a tight-fitting velvet, off-shoulder dress, Oprah Winfrey was every bit the superstar that she is. Not only did her ensemble show of her bodacious figure, it also celebrated her curves, and highlighted her beautiful skin tone perfectly. Winfrey's history with sexual and racial abuse is no mystery. The talk show host and media powerhouse has previously recounted how she was raped as a child and physically beaten up (both, several times). The woman is a living, breathing embodiment of a phoenix, and time, the Golden Globes too acknowledged that fact, as they honoured her with the Cecil B. DeMille Award. Jessica Chastain at the 75th Golden Globe Awards. Image from AP. 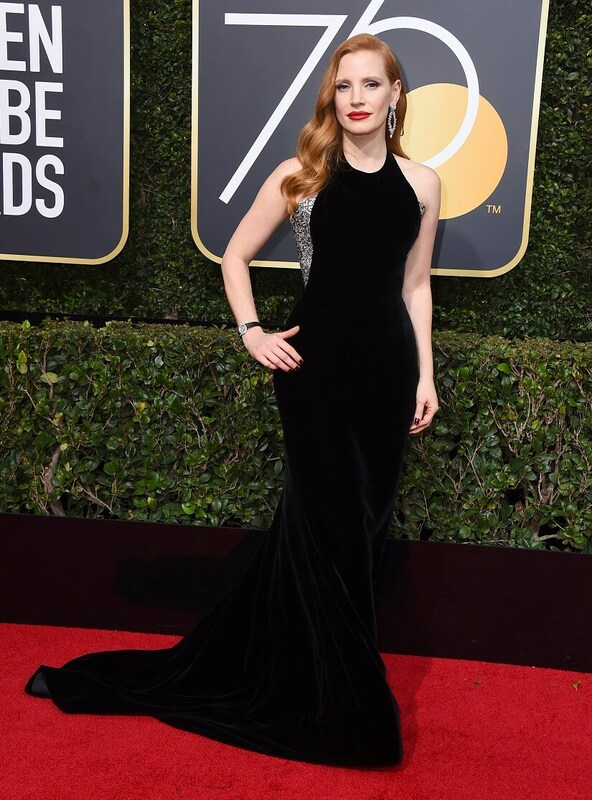 Jessica Chastain was also outfitted in a velvet number (with silver embellishments) which fit her like a dream. With her hair parted onto one side and a vivid red lip colour, Chastain was the stuff of fairy tales at this year's Golden Globe Awards. The actor recently revealed her bout with sexual harassment at the workplace too. " I had a producer spank me as I walked past him in a hallway. I didn't speak up, because I was worried that I might be made un-hireable by dissenting. As an actor, I have a lot of fear, thinking that if I speak my mind, or something that feels like it deviates from the norm as a woman, am I going to be made to disappear in my industry? When the article came out about (Harvey Weinstein), I immediately started tweeting,” the Golden Globe nominee, 40, told The New York Times. The confidence and courage that the actor thinks she fell short of earlier (although we vehemently disagree) was not even close to visible during her red carpet appearance as she exuded a certain charisma and power, even when all she was doing was standing (or taking classy jibes at the offenders who had been named, hehe). Salma Hayek and Ashley Judd at the 75th Golden Globe Awards. Image from AP. "I was sexually harassed by one of our industry’s most famous, admired-slash-reviled bosses," said one. "Harvey Weinstein was my monster," said the other. Ashley Judd and Salma Hayek have been vocal, eloquent and absolutely breathtaking in their coming out stories against Harvey Weinstein and his sexual misdemeanours, however, both the actor's were nothing short of breathtaking on the red carpet. While Hayek took our breath away in a fitted, long-sleeved gown with dazzling yet simple jewellery, Judd decided to go the slightly more flamboyant route as she slayed in a vivacious, deep-neck gown with deep red lipstick. If there was ever a paradise, this would be it. Debra Messing at the 75th Golden Globe Awards. Image from AP. 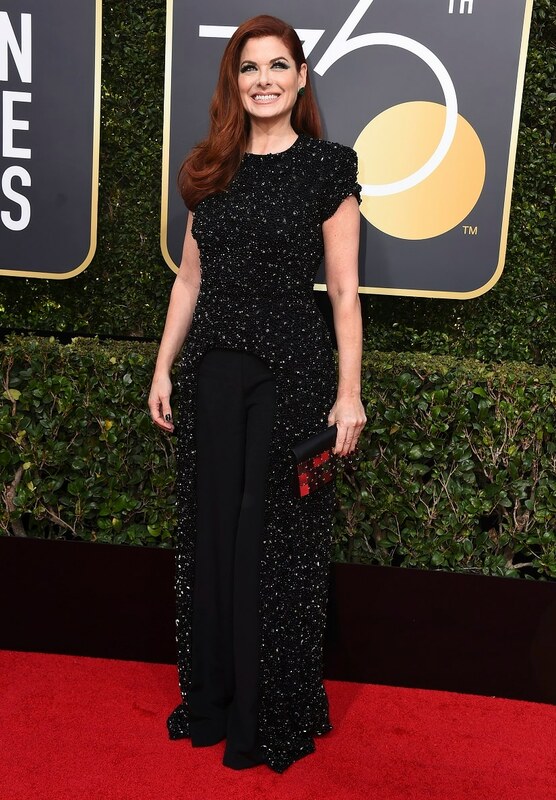 Will and Grace star Debra Messing was surely all about the grace at this year's Golden Globe awards. She coupled it with a high dosage of glamour, and a whole lot of guts and voila! Here she finds herself, nestled comfortably in our best-dressed list. Wearing an embellished ensemble coupled with flared pants, Messing looked every bit the beauty that she is. Sporting dramatic eye make-up (I mean, just look at those lashes will ya? ), Messing beamed her way into our hearts. The actor has been vocal in recounting her experience on the sets of her 1995 film A Walk in the Clouds with *ss-hat director (her words, not ours) Alfonso Arau. Arau reportedly subjected her to a series of humiliations over her body and engaged in grossly inappropriate and demeaning behaviour on the sets of the movie. 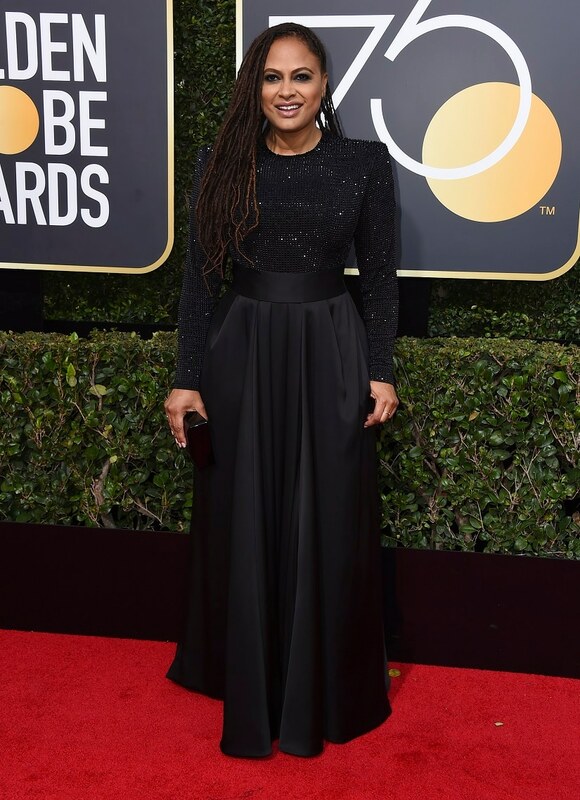 Ava DuVernay at the 75th Golden Globe Awards. Image from AP. "For all these women, women like me and many others, that protection of our womenhood isn't enough, because we're not only women. We're black. We're brown. We are native. We are Asian. We are Muslim. We are queer. We are many things that deserve safe spaces and protection. We can take this moment and enter in with focus," said Ava DuVernay. All we'd like to say to her is — you are beautiful, you are bold, you are fearless, you are strength. (Your gorgeous outfit only adds to the brownie points we've already given you). (Oh and a coupla hundred more points for those gorgeous tresses). Lauren Dern at the 75th Golden Globe Awards. Image from AP. In an appearance on The Ellen Degeneres Show, Big Little Lies actor Laura Dern revealed how it was her mother (actor Diane Ladd) who explained to her that she had infact, been subject to sexual assault and harassment as a 14-year-old child. America Ferrera and Natalie Portman at the 75th Golden Globe Awards. Image from AP. 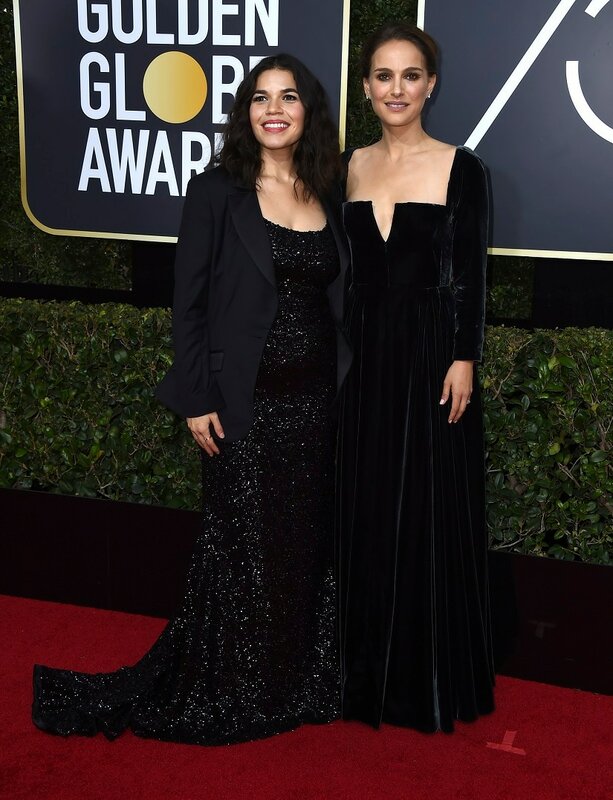 America Ferrera wore her scars like the true badass that she is to this year's Golden Globe awards as she rocked a sequined gown and added a casual blazer to go on top. The mommy-to-be's most precious (and beautiful) accessory however, was her baby bump. Ferrera also spoke up during the #MeToo movement as she recounted her experience with sexual harassment and assault. “First time I can remember being sexually assaulted I was 9 years old. I told no one and lived with the shame and guilt thinking all along that I, a 9 year old child, was somehow responsible for the actions of a grown man. I had to see this man on a daily basis for years to come. He would smile at me and wave, and I would hurry past him, my blood running cold, my guts carrying the burden of what only he & I knew- that he expected me to shut my mouth and smile back," said Ferrera. She concluded by inciting a call to action. “Ladies, let’s end this silence so the next generation of girls won’t have to live with this bullsh*t".